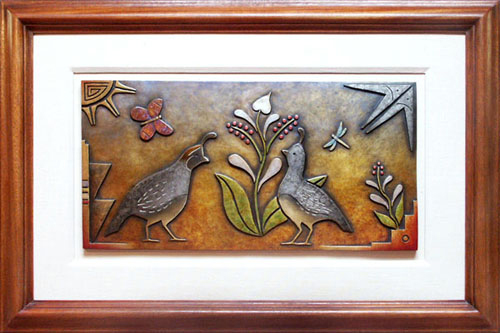 The male and female Gambels Quail is the first of my series of bronze plaques. I used the butterfly as a symbol of femininity and the dragonfly as a symbol of masculinity. Both insects go through a metamorphosis and evoke the analogy that perhaps we are born as nymphs, and as we experience life?s loves and fears we too can experience the growth of our wings and fly through the gentle breeze as well as the harsh winds in life. On the left of the plaque is a ceremonial prayer stick with the four directional colors. Two triangles on the right of the prayer stick represent prayer feathers offered in ceremony. At the top left is the sun. Within the sun is the symbol representing the Infinity of Life. At the top right is a pottery design. The patina is silver to suggest the moon which brings balance to my design. On the bottom right is a kiva altar which represents my gratitude, creative thoughts, meditations, and prayers shared with all that is life. I believe these prayers and meditations nurture life itself, so from the altar springs the new growth of a young flower. A small circle is contained within the altar to represent the Angel or Soul that gives guidance. 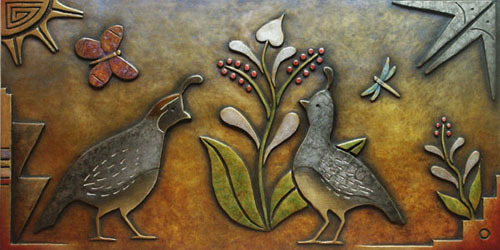 This piece was inspired by the moments of tranquility in my communion with nature, giving thanks for my place in life.